Crescent Bay using new 21:9 Samsung screen? 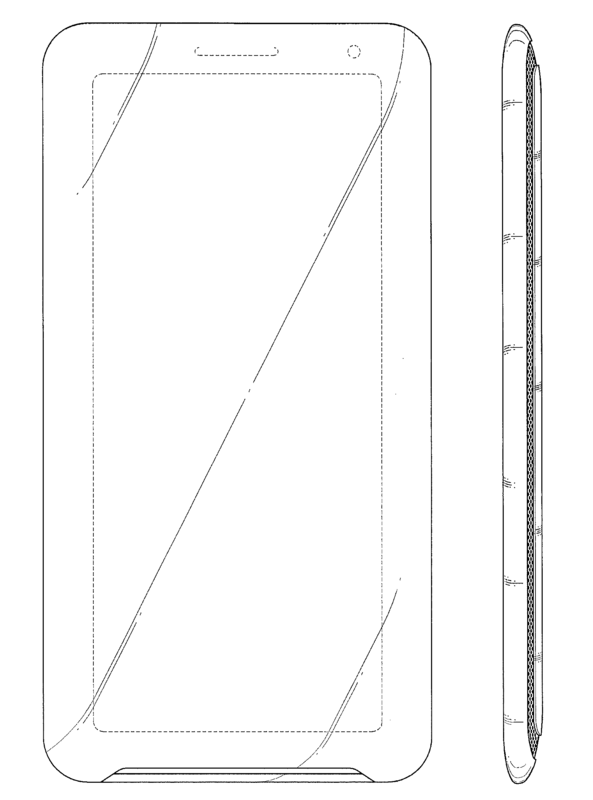 Samsung was awarded a patent for a 21:9 ratio screen back in March 2014 and it’s quite clear that a wider screen not only means a better field of view but puts more pixels on eyeballs. It’s obvious Oculus are using a new type of screen from Samsung but they’re extremely tight lipped on it’s specifications and resolution. If we measure the front view of the new headset we can try to work out the ratio of the screen inside. Obviously this doesn’t account for the actual size of the screen and possible bezel inside but its seems likely that if the Crescent Bay is indeed a prototype of the consumer version AND they’re using sample of a new type of screen from Samsung they will dispense with their trick of using screens already attached to a phone digitizer and front panel. This was a great idea to get the DK2 out to developers as quickly as possible but not a good idea for a consumer version. The glass and touch panel are not needed, only adding weight, and the bezel, however minimal, increases the size of the face of the unit. It doesn’t make sense for the consumer version to use the same trick, especially if they’re expecting to sell a million units. So, if we make the assumption that there is a bare OLED panel inside the new prototype we can make a reasonable guess that it will be as snug as possible, hence the reduced weight. The increased resolution and lack of screen door also points to a new panel, but at what ratio? 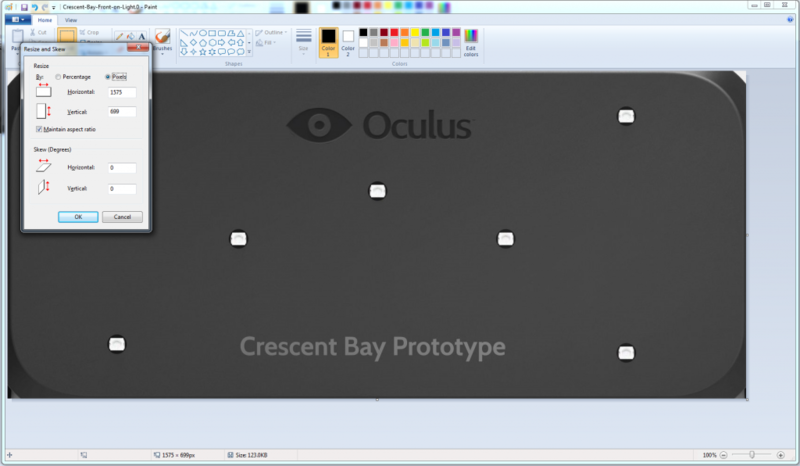 Using the best available image from Oculus here we can work out the ratio of the screen. With 1575 horizontal pixels its a matter of simple mathematics to get the ratio. Dividing the 1575 by 21 gives us a convenient 75 which multiplied by 9 gives 675, very close to the 700 vertical pixels. This is a 1:2.25 ratio, or very close to 21:9. Until someone manages to get a better look inside or Oculus releases more information we’ll have to wait and see, but with users reporting better resolutions that the GearVR headsets it seems likely that Samsung are providing a brand new panel hence the reticence of Oculus to talk more about it. One thing is clear, neither Samsung or Oculus are resting on the laurels and we can expect to see even more improvements in comfort, tracking and the SDK before the consumer release. If you’re interested in the first truly affordable motion simulator for the Oculus Rift be sure to check the rest of the site, you can also enter the raffle to win one + shipping. Next PostThrowing together a new prototype for 6DOF hand tracking…. Games in GearVR run at lower than native resolution. Why not 2 screens side-by-side ? What if the screen was a 1440p with a pixel arrangement of RGGB? So like the Pentile or Diamond displays that Samsung manufacture, but with the extra green to give your retina the impression it’s looking at a 2880p screen. I wonder if they also did a coating or lensing layer on top, which removes the black borders between the (sub-) pixels. Yes, but that doesn’t necessarily prove it’s two screens (which I think is your point)… until a screen appears in the wild we won’t know…. Just adding info that seems to be related and interesting. As article specifically states “until better look inside”. I agree with your “we don’t know”. 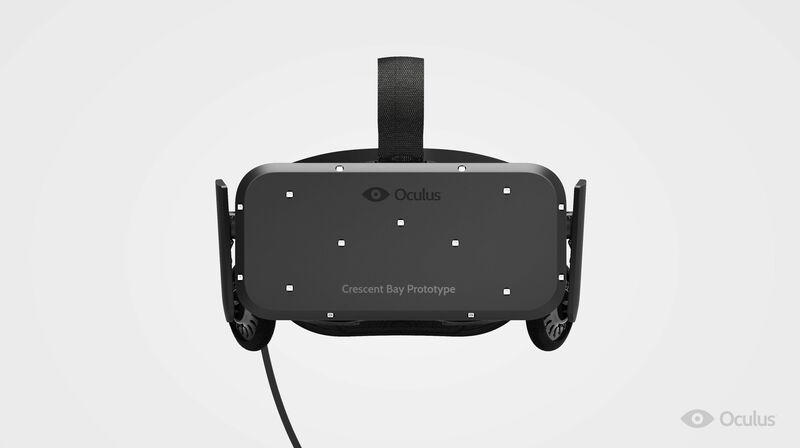 Article author on the other hand states “Oculus is using new screen”. Singular.